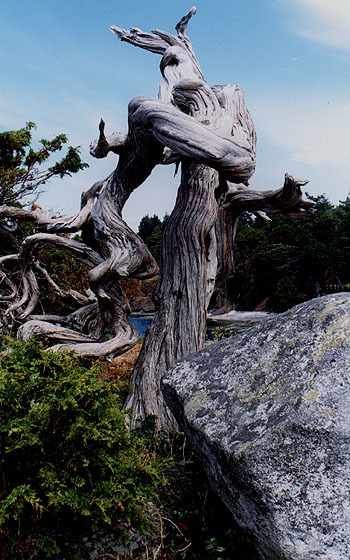 Rocky Mountain Juniper occurs along rocky shores near salt water in the San Juans. Trunks are typically knarled and shrubby. Leaves are scale-like have a cedar-like fragarance. The pale blue berries are eaten by birds, who disseminate the seeds in their droppings. Junipers are slow growing and may live for hundreds of years. Photo by Terry Domico.